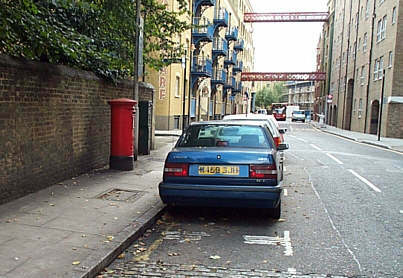 Two policeman (Jason White, Tony McHale) are in their car parked in this road when they receive a call to go north of the river as HQ are unable to get in contact with anyone there. They drive off, turning right into Cannon Street. Local café where Yob sees Fingers talking to Syd Taylor (café demolished, corner of Brewhouse Lane and Wapping High Street). 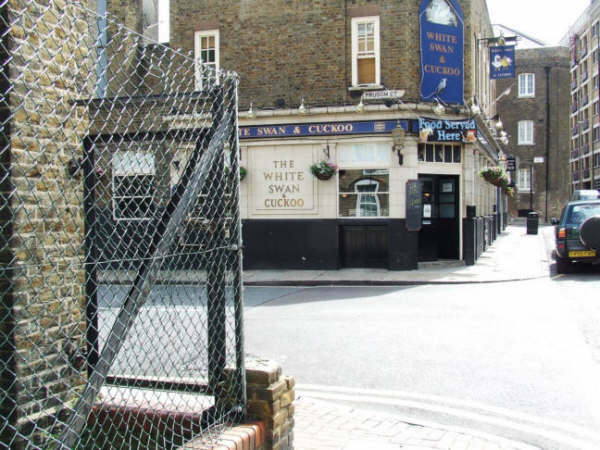 Outside a seedy café (café demolished, corner of Brewhouse Lane and Wapping High Street ) Compton discusses his plans to take Mannering's place with his cronies then drives off to the meeting. Chase down an alley, where they hide. Commander Gideon drives to the Commercial Street Police Station to talk to Commander Hemmingway. Doctor Kirk is interviewed by Gideon at the Commercial Street Police Station. 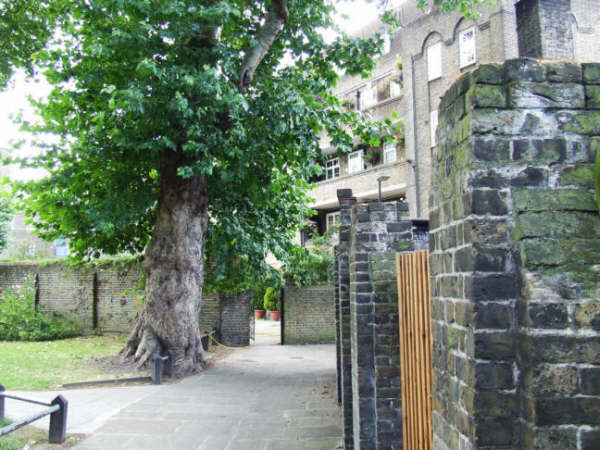 The story opens in London’s East End. Hearing at 9:30 in the morning at the Old Bailey – Syd Carter on a murder charge. Sharron and Richard race across Rotterdam to the warehouse (film is transposed left to right). Black September members Masroof (Stephen Grief) and Caliban (Shango Baku) are holding Leila Sabin (Prunella Gee) hostage. They phone from a call box to make a deal with Simon Templar (The Highway, junction of Glamis Road). A Police woman (Diane Elliott) spots Peter Wray (Alan Baulch) in the market and follows him home, number 10 Lytton Street. Police converge on Crosby Street. While working at the docks as a crane driver Jeff Broadley suddenly has a panic attack brought on by looking at the sun and leaving the controls unmanned, he causes some barrels to be dropped on the quayside in a dangerous manner. Scrambling to leave his crane, he goes outside and begins climbing down a ladder, but partway down he loses his grip and falls to the concrete below where he breaks a leg. An East end Market where Peter Wray and his mother look an opportunity to steal. After a tip-off from Yob, the police arrive in force to capture Mickey Heston who is waiting to sail to freedom. John ‘Benny’ Benson (Derren Nesbit) and Freddy Tisdale (John Hurt) arrive at a warehouse to meet Charley Muliver. Later Muliver drops of Syd Benson (Michael Cashman ) at the warehouse. The van is spotted by a policeman, PC Abbot, who sends in a report. Det. Chief Insp. Keen (Alexander Davion) goes to investigate and guesses that Benson is in hiding locally. More policean are sent for and by the time Commander Gideon (John Gregson) arrives, the chase is nearly over. (Locations in and around St Katharine’s, Harrison’s Wharves and Irongate Wharves, and Little Thames Street demolished as part of the St Katharine’s Dock project). Alan Jordan (Michael Robbins) and Sheldon (Mike Pratt) arrive at the docks looking for someone who may have overheard their plans. Marty Cranwell (Ken Parry) had already telephoned Mannering to meet him there. He waits in the shadows while the villains hunt for him. Paul Buchet (Tony Anholt) searches the river bank and interviews an angler for information about the missing security van. The Saint's Jaguar follows the school bus past Tower Bridge into St. Katherine's Dock the children leave in the bus and are followed to the boats. Simon Templar (Ian Ogilvy) and Captain Leila Sabin (Prunella Gee) watch as someone picks up his passport from Garston (Audrey Morris). A chase follows. Simon Templar (Ian Ogilvy) and Annabel West (Gayle Hunnicutt) rush out of Alice’s Discoteque, Marseilles, in pursuit of the man who has just stabbed a detective to death in the club. They chase after the murderer’s car in Simon’s Jaguar. Ray Dennis (John Woodvine) returns in a launch after showing Buzz Wepner (Paul Maxwell) Tower Bridge. Dee pulls up in a Ford Consul to let The Invisible Man out, and drives off towards Tower Bridge pursued by a black Ford Pilot. Carlos Varell (Carlos Thompson) drives his Aston Martin to the offices of Mercury International (by Butler’s Wharf). Establishing shot of the Bridge. London bridge is seen from the docks (Lower Thames Street) where McGill’s boat is waiting to take him to Portugal. It is early morning in London, and in a nearby warehouse mischief is afoot. Catherine Fraser (Tessa Wyatt) and Tim (Christian Roberts) take a trip on a Thames riverboat. Tim explains his reasons for quitting medicine. Jim Batley the fake policeman (John Atkinson) threatens Mombasa (Oscar James) as they drive off with Joey (Paul Medford). Ray Dennis (John Woodvine) and Sammy (Alfie Bass) track Simon Templar (Ian Ogilvy), Posing as Sir Malcolm Street, to Tower Bridge. Later Sammy (Alfie Bass), Simon Templar, Inspector Ashton (Stanley Meadows), Jenny Stewart (Fiona Curzon), Buzz Wepner (Paul Maxwell) and Mrs Stewart (Sally Lahee) take a launch up the Thames to see Tower Bridge and celebrate their victory. First fire lit in Lambeth (Gun Wharves). Later, after lighting a fire at Atlas Paint Co. Tom Bishop (George Cole) leaves the scene on his scooter (St. John’s Wharf). (Identified by Stephen Carter, August 2007). Syd Taylor squeezes into the back of Mary Henderson's Jaguar outside North East Division Police Station (Wapping Police Station). Fingers (Dermot Kelly) is walking home (past Gun Wharves) when he hears the sound of a bike. It is Yob (David Gregory) who has followed him from the café. Yob corners him (in the Alley between Wapping tube station and Gun Wharves) makes sure Fingers does not tell any more tales to the police. Sergeant Syd Taylor (David Davies) peers into the window of a local pub (Town of Ramsgate Public House), suspicious that Mickey Keston is nowhere to be seen in his usual Saturday night haunts. 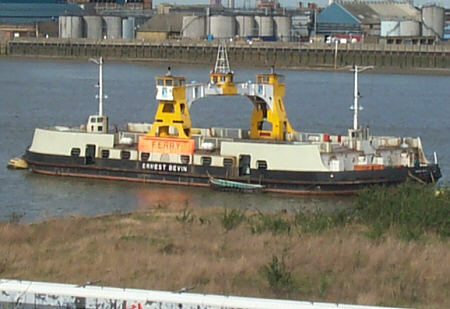 Chris Kirk (Howard Knight) walks past Orient Wharf. Later, after Tim Murphy (George Sewell) has chased Chris Kirk (Howard Knight) and Vince Kelly (Michael Craze) across a bridge, the boys are chased through the streets to the Colonial Wharves and Chris Kirk stands his ground in one of the warehouses. Keen and Gideon also end up at the docks (Gun Wharves). Outside a seedy café Compton discusses his plans to take Mannering's place with his cronies then drives off to the meeting. Later Mannering gives his statement to the police after being attacked on the building site (Wapping Police Station). 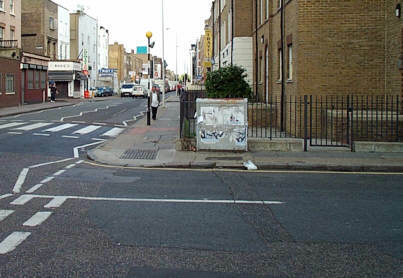 The police car travels along this quiet street (passing Scandrett Street on the left) and one of the policemen (Jason White) comments how deserted it is, “as if everyone's gone to Mars”. Rose Lenman (Virginia Maskell) with her suitcase becomes aware she is being followed and turns left into an alleyway (Wapping Old Stairs). An East end Market where Peter Wray and his mother look an opportunity to steal. After being caught in the act Peter Wray (Alan Baulch) runs through the market and into a side passageway. After being caught in the act Peter Wray (Alan Baulch) runs through the market and ducks into a side passageway leading to a yard. Establishing shots of the East End include this Market. Establishing shot London Docks where Jordan and Sheldon arrive looking for someone who may have overheard their plans. After running across a railway footbridge Peter Wray (Alan Baulch) runs straight into the path of Commander Gideon’s (John Gregson) police car. Gideon gets out to see if the boy is in one piece, but he runs away. Peter Wray (Alan Baulch) runs across a railway footbridge and down some stairs into a street after stealing a purse in the market. Tim Murphy (George Sewell) Chris Kirk (Howard Knight) and Vince Kelly (Michael Craze) chases the boys across a bridge. Former British agent Freddy (John Carson) is sleeping off a heavy night in an abandoned building when he is awoken by the arrival of two Land Rovers carrying Professor Taylor (David Swift) and his men. The men search the building and find a guinea pig which bites Tayman (Lionel Guyett). Professor Taylor is forced to shoot Tayman. Freddy watches as Taylor and his men drive away with their prize. The tour bus arrives at a deserted dock by the Thames. Tina (Sara Kestelman) tells the passengers to hide their weapons and make theselves comfortable. Bart (Prentis Hancock) checks checks his weapon. Frank Hardy (Joe Dunne) tries to escape to warn Steed but is shot by Tina. In the morning Brady (Keith Buckley) arrives with the S-95 gas and hands it over to the helicopter pilot (Peter Godfrey). He makes a final inspection of the gang before they set off. Gang memebers include Fred (Gavin Campbell), Ben (Dave Schofield) and Bill (Leo Dolan). The fire brigade races to the fire at the Atlas Paint Company (past Rothschilds which was at no 748 just north of Browning Road). A model Cessna flies over London to drop a message from PSEV into Brodny's punchbowl at the London embassy (aerial footage of The Isle of Dogs and Rotherhithe). McGill makes his way to London’s docks where a boat is waiting to take him to Portugal (stock footage from flats on Newland Street). Jeff gets an anonymous phone call which tells him to go to the Depford Warehouse, Southern docks and talk to Harry Dawson for information about Johnny Crackan (stock footage from flats on Newland Street). 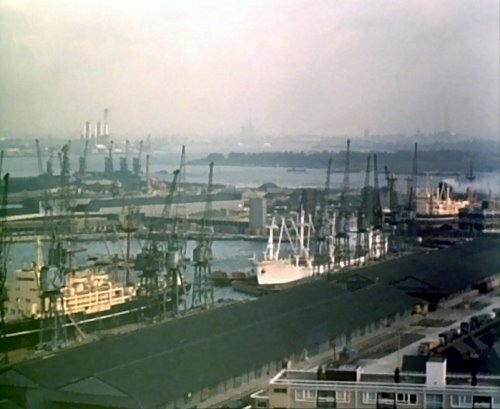 Marty is held captive aboard a Russian ship in the London docks. The lorry carrying the two boys arrives in London. Chris Kirk (Howard Knight) and Vince Kelly (Michael Craze) jump out before the dock gates (Mallet Street). Peter Brady causes the freighter to crash into the dock wall narrowly avoiding two dockers. 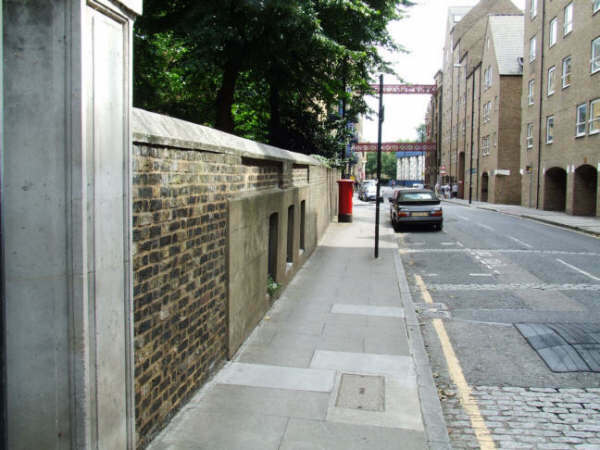 The boys are spotted by a police man (standing by The White Swan, 97 Wapping Lane) and are chased through the streets. Establishing shot of the ferry, where Jennings is discussing how George Roden has moved in on the Jennings brothers' pitch.